oh WOW.. isn't it funny (not really) what people don't know about you... but thanks for sharing this. I can only imagine how scary it would have been. Are you completely healed now? And Japan. God, words can't even describe :( we can only pray. Great post, MiMi, in all sorts of ways. Scary stuff indeed MiMi, glad you made it through the whole horrible experience, let's hope the people of Japan do too. @catty - Not healed, but I'm hypothyroid now, which is the opposite condition and a common consequence of the radioidine treatment - I think 50% of patients get it. Anyway, being hypothyroid is ok - I have to take levothyroxine daily but that's a natural hormone so completely safe. I'm not particularly religious but even I'm praying this works out ok for Japan. @FoodUrchin - Thanks, and so do I. The second time we went to Japan, my husband and I went to Hiroshima and I cried the whole time I was there. Oh MiMi - that's awful. Hospitals are bad enough without all the added post-treatment solitude you had to suffer. So glad you're pretty much better now, at least only having to take a natural hormone. It does make you stop and think doesn't it, how things that are so normal can so quickly be stripped away and everything turned on its head. I'm entirely non-religious, but I'm thinking hard on Japan and hoping that everything is fixed as best it can and that the consequences aren't too horrific for anyone. Hi Mimi, incredible post, it's really terrifying what's happening in Japan and all the worse for not knowing for several years what the full impact from radiation will be. Glad to hear you got through your own experience too, I knew nothing about this condition before. @The Grubworm - It's funny - that's the only time I was scared to be in a hospital. I've grown up around them as my parents are doctors. But that was a decidedly different experience. Yeah, I think that's what I'm doing too - sending good vibes. @Sarah, Maison Cupcake - Thyroid disorders are really common, especially in women, but unfortunately they often go undiagnosed because the symptoms are similar to lots of other illnesses. Though your experience doesn't sound pleasant, somehow you made it easy and (can I say?) fun to read. I didn't know all these, it's strange to think how something can be poison and medicine at the same time. But I guess it's not so radical after all, too much of anything is never good. Whatever happens, I wish more information I got on Japan and radiation is as clearly stated and well founded as this. :( Am very sorry you had to go through that but I'm glad you're better now. It's terrifying to think what could happen in Japan as it's such a large scale and... yeah, it's just not good. We have hypothyroidism in common. Mine was induced by lithium therapy for depression so now I too have to take a daily dose of levothyroxine. The weird thing is that a high one-off dose of radioiodine (like I had here) is safer than low but sustained exposure. The former destroys the thyroid gland (which is why it's used for medical purposes), but the latter can cause thyroid cancer. @Su-Lin - Thank you, and no, it's not good. @Joe Cassels - Oh, I think I'd be too paranoid to live that close. Hypothyroidism is a pain, isn't it - but better than what came before! Oh wow, MiMi! I'd like to echo catty's comment, it is often astonishing the things you don't know and would never even imagine people have been through. I'm scared of hospitals anyway, I'm in awe that you managed to get through that but I imagine in that sort of situation you just have to. Glad that it is sort of fixed now though, even if it has meant going too far the other way. I'm the same as the other non-religious people here, just hoping that everything is somehow okay in Japan. Wow that is really a terrible thing to go through, thanks so much for sharing it! I was just researching food that helps detox radiation poisoning and found that miso is really amazing. 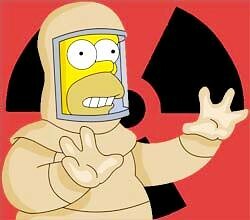 Hopefully the Japanese near the nuclear plants are able to have access to food. I used to follow you a lot a couple years ago when I was watching all of those fantastic cooking videos of Burma, but I lost track somewhere along the way so it is great to find you again! I used to live in Burma so I sure miss the food there, I may have a chance to go back this year. Finger's crossed. Hey - we can be autoimmune buddies. The radiation thing is crazy. It seems so odd to me that something so invisible and abstract can have such a major effect. My thoughts have been with the people of Japan too. As you say, we willingly put radiation into our bodies (ironically, to make us better! ), but people of Japan have no choice. @hellaD - Hello *waves*. That's encouraging to hear about miso - I swear the Japanese have the best diet - eg the Okinawans are one of the longest-lived people around. Thank you re Burmese videos - will upload more soon I hope. So cool that you lived in Burma! @Miss Whiplash - Automimmune buddies? Ha! So you're hyperthyroid too? I can 100% say go for the treatment - taking levothyroxine just means popping a pill daily - otherwise you're pretty much normal and I've never noticed any side-effects. @No Love Sincerer - Yay - have never known anyone who had the same treatment - although family members on both sides have been hyperthyroid, they all stabilised on the carbimazole or had thyroidectomies. Great post too. Am so pleased so much effort is being made to support Japan by everyone in the food community eg the Cakes for Japan appeal and #Bento4Japan. You're right that auto-immune diseases come in pairs - my aunt has diabetes and my mum has pernicious anaemia, and both are a result of them having had hyperthyroidism. Anyway, ladies - FREE PRESCRIPTIONS! Yesterday I took the Radioactive Iodine R-131 pill, a 100 millicurie treatment dose, administered from a double sealed lead container by a nurse with protective gear and a Geiger counter. This is said to be the equivalent of 500 dental xrays, and I'm now in isolation, forced to stay 6' minimum from my husband, son and worse of all my 3 beloved lap dogs for a week. The humans can understand, but the poor dogs think I don't love them anymore, and kept me up all night scratching the guest room door. As a child of 9, I was originally diagnosed with hyPOthyroidism, aka slow or lazy thyroid (lazy sounds like a choice, a word I don't agree with) and have been on many different thyroid replacement drugs over the years, and have had a lifetime of divergent symptoms: racing then too slow heartbeats, periods of anxiety attacks followed by manically high energy / confidence, paralyzing migraine headaches, uncontrollable weight gain and loss, and more. In 1991 at age 37, I had my left thyroid lobe removed due to a 3mm malignant nodule, followed by radiation. Then the right half of my thyroid was removed April 12, 2012 when another malignancy was found, this one 1.5cm, and now more radiation. I have a double set of necklace scars, the second set still quite fresh and the muscles still very inflamed from this second insult to their otherwise fine work. For the past 6 weeks, I've not been allowed to take any of my daily thyroid replacement hormones; this was supposed to get my TSH level up, as the higher or hungrier the system is for the iodine the thyroid needs, the better this treatment works. But this is wreaking havoc on my kidneys and more, and the radioactive pill is still in my system, so today is day 2 of 8 days isolation and discomfort. Ironically, over the summer we hosted some exchange students from Funari High School in Hiroshima, Japan, the sweetest girls ever, and I know that they and their entire country faces a future of thyroid and digestive woes, as radiation, the silent menace, may have already done it's damage, and it takes years to reach fruition. 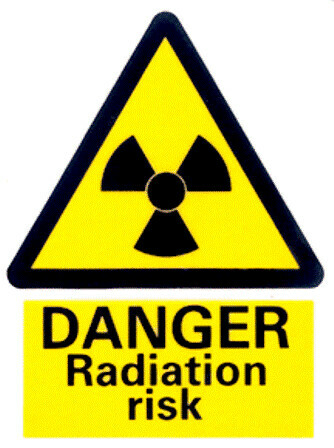 My Endocrinologist said it's likely I was likely exposed to radiation as a child; my Father worked at a GE facility where it was handled daily. It's likely his clothing carried low doses home daily, and being exposed as a child/baby is the most dangerous time. Around age 4, I also sat at this facility and watched the ladies paint the numerals and watch & gauge hands with radium, the agent that made these things glow in the dark. These women used their lips to shape the paint brush into a fine point for this tiny work, and sometimes one sweet woman would paint her teeth and turn the lights off to be funny. Poor thing, her insides probably turned into charcoal briquettes. God forbid she had contact with babies! But for now I'm in this isolation mode, very bored as I've been told to limit contact with anything I can't throw away. I was advised to wear gloves before using computer if I had to use one, and trust me, I'm in need of things to do to pass this time where I'd usually be cooking, or at my son's school, or elsewhere in close proximity to many people. This might not be terribly common for humans but in house cats thyroid problems are very common. One of my darling cats had the same treatment you did. She was given radioactive iodide... it seems to have cured her problem. From what I've seen with cats the radiation treatment is so much nicer, less discomfort during the procedure, less complications afterwards, MUCH better long term prognosis. So maybe it is scary, but it seems to be the best treatment out there- you made a good choice.